The City and Gateway Urban Design Framework was released in December 2018. The Framework and other details can be found here. This covers future development on the strip along Northbourne Avenue from Stirling Ave in Watson to the City. The areas affected in Downer are shown in the map below. 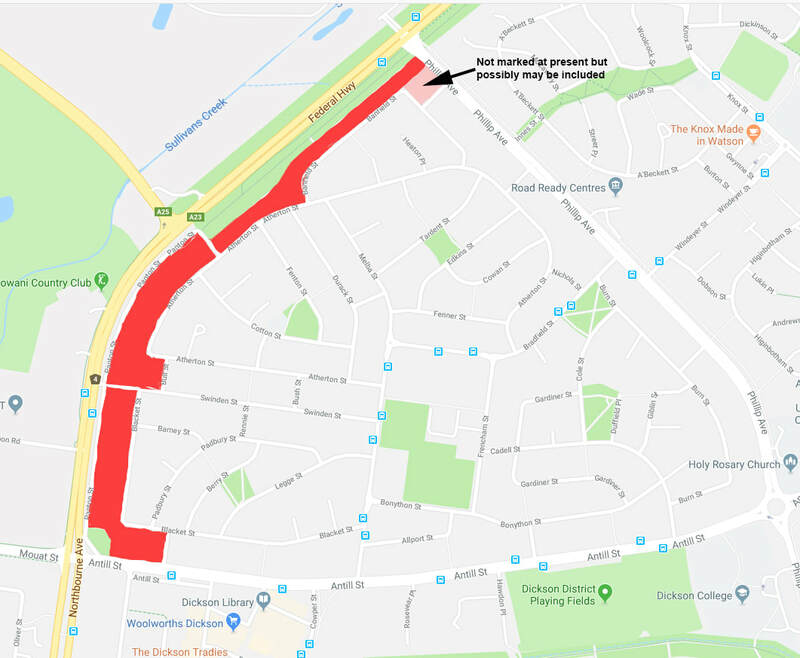 Among other things, the Framework proposes significant changes to Downer's development, including new height limits on Panton, Blacket and Banfield Streets, of 18 metres, 12 metres and 12 metres, respectively. Separately, at the end of 2018, the ACT Government released the 2018 ACT Planning Strategy. 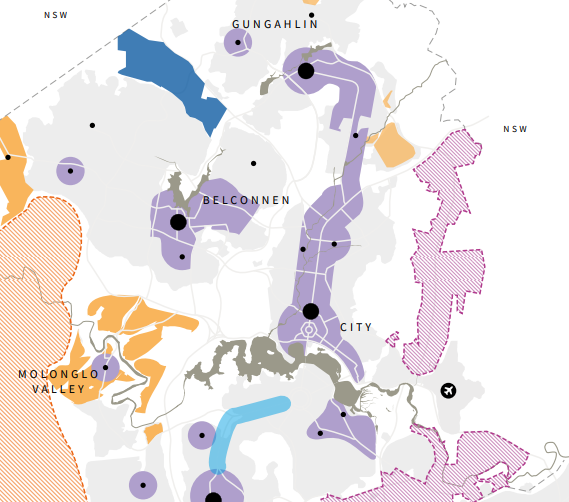 This strategy, which the Downer community has not been consulted on, identifies Downer as an 'Urban intensification locality' (see second image below), the definition of which is not yet clear. At a public meeting on 4 February 2019, the DCA provided a presentation (which you can view here) on what these proposed changes mean for Downer, and the questions we have for the ACT Government. We will keep the community informed of our engagement with the Government. The DCA made a submission to the National Capital Authority's public consultation process on 'DA91', the amendment to the National Capital Plan that will give effect to the City and Gateway Urban Design Framework. You can read the submission here. 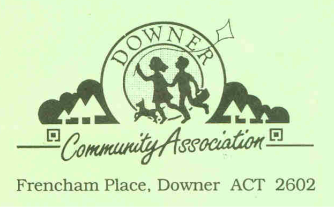 In the meantime, if you have a view on the proposed changes to Downer, please get in touch with us at downerassociation@gmail.com, or - better yet - contact one of our MLAs or Planning Minister Mick Gentleman to let the ACT Government know what you think about the proposed urban intensification of Downer. 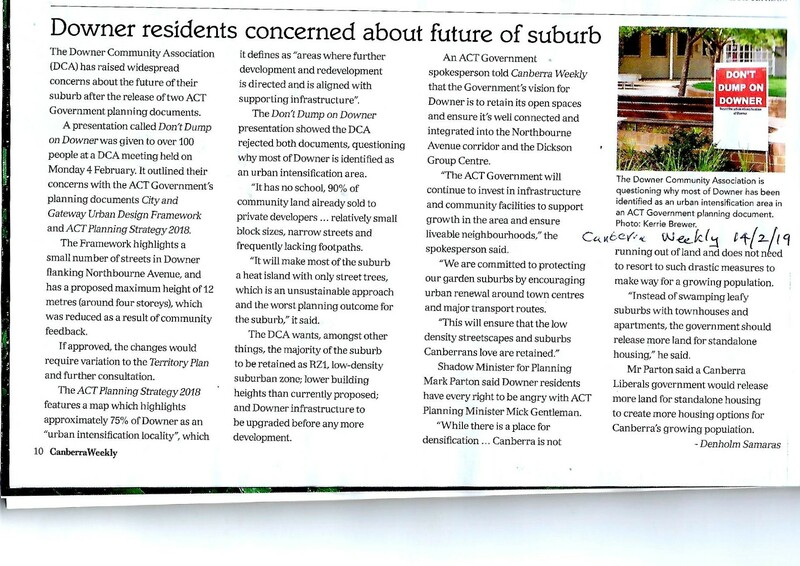 There has been substantial media coverage of the issue, in Canberra City News, the Canberra Weekly and in the Canberra Times here and again here (following the DCA's meeting with the Planning Minister to clarify what 'urban intensification means for Downer). This presentation, prepared by the DCA, sums up what has happened to date, and our next steps. We want your help to shape Downer's future! Stay tuned for more details about the 'Downer by Design' community workshops.